This caught my eye today. Notice anything unusual??? Actually looks quite nice and probably works well also. I know the standard response to such ads is "if it was closer I'd be all over that...", but in this case, I've been semi-looking for a clean late model R100, with it's monoshock suspension and tubeless wheels. The bags are standard, and the fairing is a nice plus. Wow, wish it were closer, I might be all over that! Be kinder than necessary. Everyone you meet is fighting some sort of battle. I think if someone could buy it for $3500 it would be a very good deal. Yep, the way Airhead prices have risen and the demand increased, anything at or below $4K would be a good deal. I like that color on these Beemers. Personally, that price looks about right for the miles and condition. I don't think they brought a lot of these into the USA around that era. One thing about these last airheads, is that the 91-92 had a single disc up front, although the bosses are already there to add a second disc. Looks great with the SP upper Steve. Excellent weather protection as you know. Has all cases as well. Wow Rob, that is a beauty, love that blue. Had no idea you had that in the "bahn". Yeah, the SP fairing really works well. How does the Beemer compare? Hope we can rendezvous sometime this Summer. Any road trips planned? Nice looking 1991 Beemer! I'm still putting miles on my 1991 R100GS. These pre-21st century Beemers carry their weight fairly low, and the bikes aren't all that heavy. Airheads = good older bikes that tour really well. Lannis, can you finish after the dot dot dot? Sorry, overuse of the ellipsis is my annoying internet-era habit instead of using LOL and "4 u" and such. "If that bike was a book, the publishers would be getting sued for plagiarism! The ad ought to at least give Guzzi credit ...." for the owner's use of the Mandello wind-tunnel-developed Guzzi SP fairing on this BMW. Period. Got it. Thanks! Didn't pay any attention to the fairing. 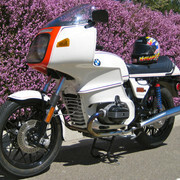 Speaking of BMW airheads and fairings, I'd still like to own an R100RS, with the BMW (Hans Muth) designed fairing. Although the earlier models with higher performance cams and larger Bing carbs generated 8-10 more hp, I'd prefer one with Monolever, built on the R80 chassis. I know that many Guzzi riders "Pooh-Pooh" the airhead Beemers, but IMHO and experience they are great touring bikes. 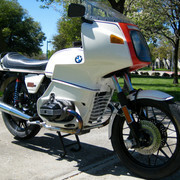 I have had four (4) in my time, and this was the last one...a 1978 R100RS "Motorsport Edition" with $11,000 in upgrades from CC Racing Products (San Jose BMW) in NORCAL. It was a formidable machine...Sold to a collector in Wisconsin a few years ago for $8995. If on close inspection it checks out, offer $4,000. If he doesn't budge, pay him. It's worth it. 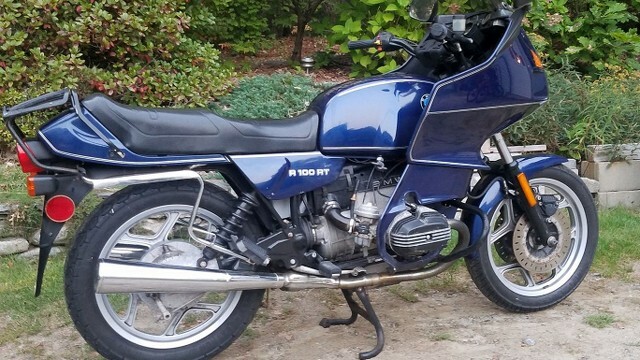 I believe BMW made 200 R100 Classics for 1991. The Germans are loathe to let running gear, chassis, body shells go to waste when new models are coming out. Hence, MB, Porsche, BMW always have special editions to get rid of them. This bike was nothing special but I’ve loved the look for 25 years. Basically, the factory was moving to the paralever layout and had these monolevers sitting around. An absolutely wonderful bike. I wish I had the room. Well, if 'twas me, and I were looking for a bike like that, I'd nose around a little bit and then I'd realize that this here bike won't do a thing that a real Guzzi SP wouldn't do better, except be a BMW, so I'd go for (another) SP ... ! So, is your 94 Mystic, an para lever rear suspension? Those are really the "last" of the airheads, IIRC. I sold a 84 R80ST last summer. Nice little bike but very bland. Had 58k on it and ran well. My Mystic is paralever. A special edition R100R. In 1992 BMW only produced K bikes with mono lever and R bikes with paralever. I’ve never seen what the big deal was about. Mono lever is much less potential trouble. When I was younger and not so smart , I would ride my 88 R100RS with some others at triple digits on Alligator Alley in south Florida from Naples to Fort Lauderdale. Back then the cars were just as fast as we were. You’ve probably never experienced a sport high speed fairing as good as Hans Muth’s R100RS. Absolute stability - like you could get off the bike and walk on the pavement at triple digits. And yes - he is still alive! I guess I should have kept that bike. I saw that add on one of the BMW facebook groups and I thought that was from a SP! I did own a smoke grey 81 R100RS. And yes, it's one that I should have never sold! BTW, Hans Muth is reportedly going to be in the Philadelphia area this summer at an event to celebrate the R65 LS, another HM cration. I recall that one of these Monolever airheads was on the floor at Andy Pelc's BMW dealership in Canton, Michigan in 1991, when I purchased my R100GS. I remember thinking at the time that this bike was possibly the last of the simple BMWs, Having said that, my GS isn't the height of complexity, but the fact that this was one of the last Monolever bikes had me thinking "end of an era." If I had the $$ and could find a nice one at the right price, I'd love to own an R80GS/PD. Monolever and all! EDIT: Had the GS out for 125 miles today (4/17/19.) After lots of refreshing, the old gal feels pretty good at 156,000 miles. I hope to be up to a ride out West this summer on this machine. The two of us have traveled from Cleveland OH to Colorado, Arizona, Utah, etc 3-4 times over the past 25 years, and I want to do it just one more time. The bike is up to it if I am! EDIT2: Another GS day (4/18/19.) Took all the back roads I could to remember from Hudson OH to New Philadelphia OH to stop off and visit with my long time BMW dealer, Gene, at Mathias BMW. Did the same going home. 197 pleasant miles .... very windy, but warm. A lengthy section of US21 (Alternate I-77) has posted speed limit of 65. Most traffic was moving along at 80. Not wanting to get in the way, I kept with the flow. Tach was showing 5000rpm for several miles. The old gal still needs a new monoshock, and she's almost ready for a new set of Metzeler Tourance Next shoes! Turned 157,000 miles today. Paralever is a key element in what made the R100GS of 1988 onward a much better sport bike than any production BMW produced before that time. It was actually the best sport bike BMW made for a number years, although eventually when the the R100R came along it was better, mostly due to much improved front brakes. The previous monolever bikes were OK for touring but nowhere close for sport riding. Some guys managed to be pretty sporting on the monolevers, and even the twin shocks. But take a look at what they did to the 90S so it could win Daytona. So you're probably right about that. The only trouble with riding a GS sportingly is that damn drive shaft and failing u-joints. There's a reason the R80G/S was the choice of round-the-world travelers. Currently, Ted Porter's Beemershop offers an aftermarket driveshaft that is rebuildable, and less expensive than the OEM shaft. I recall a dealer telling me that when BMW introduced the R100GS at a dealer meeting, it was pitted against a K75S. 58hp vs 75hp. Rider "A" rode the GS, rider "B" rode the K75S. This was on a track course. The GS won the race. Then the riders swapped bikes, and again, the GS whipped the K75S. As archaic as the GS is, it is still far better than my riding ability. About the brakes, no kidding!